Kappus Landscape Sprinkler strives to give back to our community, especially in ways that impact the environment. This makes sense when you consider we spend time literally hugging trees. Well, installing them, but it looks about the same. We want to do our part to help preserve our local and global environments. We have done pro bono projects for Non-profits whose missions we support, and we try to lessen our environmental impact as a company by doing things such as installing a large solar array to power our shop and office, utilizing hybrid and electric vehicles (powered by the solar array, of course) for company business when we can, and promoting a company culture that values mindfulness and recycling. We also provide maintenance to our customers where we exclusively provide organic fertilizer. Kappus Landscape Sprinkler’s Owner, Kurt Kappus, operates machinery while helping complete a landscaping project for the Bears Ears Visitor Center in Bluff, Utah. Kappus donated the labor and landscaping materials for this project. 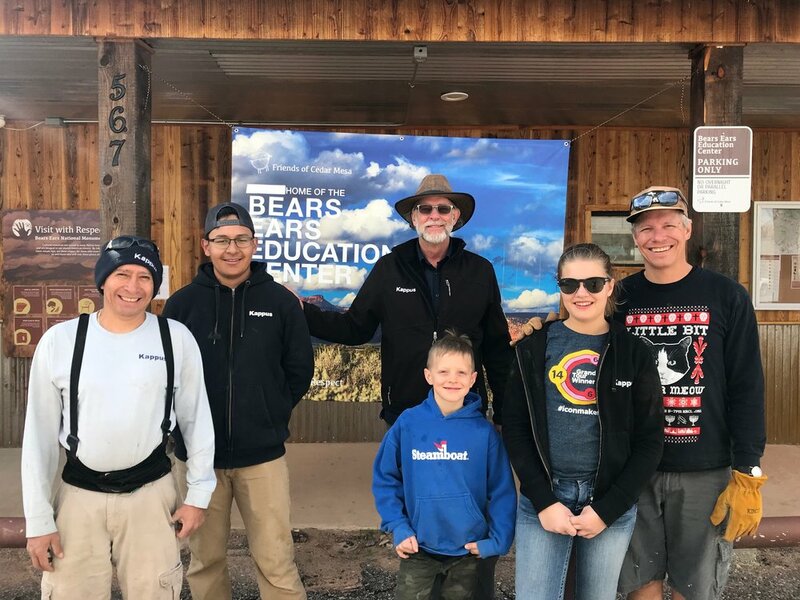 Some of Kappus Landscape’s volunteer work crew for the Bears Ears Visitor center in Bluff, Utah. Kappus Landscape Sprinkler strives to give back to our community, especially in ways that impact the environment. This makes sense when you consider we spend time literally hugging trees. Well, installing them, but it looks about the same. We also provide maintenance to our customers where we exclusively provide organic fertilizer. Nearly completed donation project by Kappus Landscape Sprinkler at the Bear’s Ears Visitor Center in Bluff, Utah. This Electric vehicle is part of Kappus Landscape Sprinkler’s fleet in an effort to help reduce our emissions for trips that don’t require a crew truck. We also charge our electric vehicles with solar panels! This Electric vehicle is part of Kappus Landscape Sprinkler’s fleet in an effort to help reduce our emissions for trips that don’t require a crew truck. This Hybrid vehicle is part of Kappus Landscape Sprinkler’s fleet in an effort to help reduce our emissions for trips that don’t require a crew truck. Satellite image of the Kappus Landscape Sprinkler office and nursery showing our solar panel array that powers our shop and electric cars.